What to find at Mike’s? It’s both, shop and event location. At the shop buy or let Mike repair things like old top hats or luggage that’s a hundred years old and so on. Everything you find here is rather old, for sure special and definitely cleaned/repaired with lots of care and devotion to details. 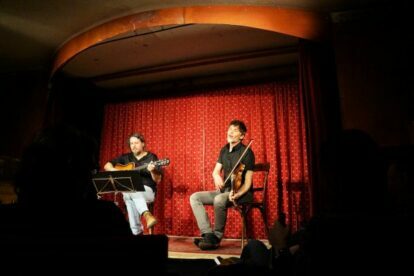 When in Vienna and seeking a rather intimate concert feeling, look for Mike. Seats are limited to 30 only, so you’d better be quick when spotting a show you might be interested in watching. The reservation system is as unique as the whole place. Mike is sometimes very busy and it might take him a bit to reply to emails, so if you have the chance to call to reserve tickets, do so! When leaving a message on his answering machine name all the details (your name and contact number, name and date of the event, how many tickets). He’ll only call back if the event is already fully booked. The event area is oh so very charming, the little, red stage and the ancient chairs on which the audience takes their seats. Mike does offer some drinks (wine, beer, and juice) but for a larger range of refreshments go to his neighbor Das Moped, a cool bar with a nice menu. The opening hours apply only to the shop, not to the concerts – for which Mike usually reopens one hour before the respective beginning.